One of the reasons I felt more balanced last year was because I made time to read. There is just something so magical in getting lost in a book, an alternate universe where your imagination can wander and for the time being, being absorbed in a really good story. I had a mental list of things that made me happy, and made sure that I spent some time doing those things. I found time to read. I watched less TV and read more at night. Instead of my old habit of browsing Pinterest and Instagram before bedtime, I shut off all electronics and read books instead. (ok, most times I read on my Kindle). I’m excited to read more books this year and will post my opinions/book summary on the blog. – Gone Girl by Gillian Flynn / this book was a ride. I got really emotionally invested in the characters. There were times I couldn’t decide which character I hated more, but just when I knew what was happening, I’m introduced to a new twist. It really makes you think about how easy it is to be manipulated and that each story has different sides. I thought the ending was ok, made me liked the book a little less, but maybe the ending was done that way for a purpose. Everytime this book comes up in conversation, I always like to ask “what do you think of the ending?” I read this book while the movie was out in theatres but didn’t finish it in time so I will be renting the DVD soon. – Heaven Is Here: An Incredible Story of Hope, Triumph, and Everyday Joy / I think Stephanie’s blog was the first blog I’ve ever followed consistently back in 2009. Her story is very inspirational and I really admire her for her honest account of everything she went thru after she was burned in an airplane crash. I read her story on her blog back in 2009 when I was single and no kids, even then, I was inspired by her. Now that I am a mom, her story means so much more to me and I can’t imagine going thru what she did. The tears just poured from my eyes while reading parts of her book. I still follow her blog and love seeing her pictures on Instagram too. 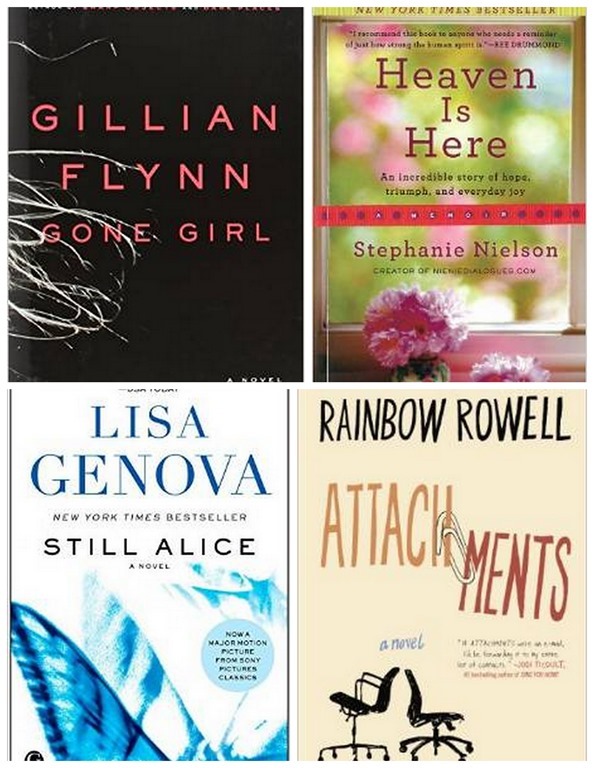 Still Alice / this book is about a woman in her prime and was diagnose with early onset Alzheimer’s disease. This book has changed me forever. It really made me think about life in general and what really matters most. It is very thought provoking, the way everyone reacted around her and what she thought about her rapid decline. I read this book very quickly and was hard to put down. A movie is coming out soon and I’m excited to see that too. Attachments: A Novel / this was a quick read and I read most of it in a cafe. This was chosen for my mommy book club, something light and quick after reading a serious book the month prior. I can personally relate to the story in this book and it’s funny looking back now at the imaginary fears of having my emails monitored. I would consider this a rom-com, and I loved that genre. We had discussions about how we thought the male lead would look like and to me he looks more like Clark Kent. I will probably read more books from the same author. What are you currently reading? Got any recommendations? ooh thank you for all these suggestions! i’m currently reading The Good Girl which is supposed to be the next Gone Girl! Thanks for mentioning this book, I read is last month after you mentioned it. Oh, Chloe and Owen….